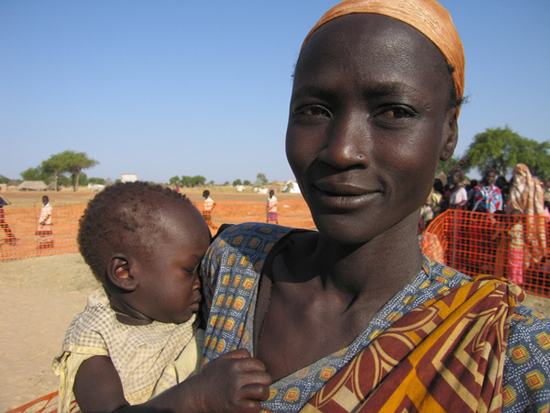 A mother and child at MSF's supplementary feeding distribution in Abathok. 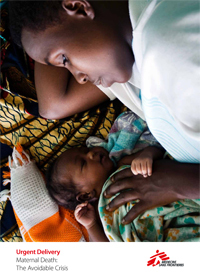 Every day, approximately 1,000 women die in childbirth or from a pregnancy-related complication. Maternal death can occur at any time in pregnancy, but delivery is by far the most dangerous time for both the mother and the baby. The vast majority of these deaths can be prevented if access to emergency obstetric care is ensured. Experience shows us that at least 15 percent of all pregnant women worldwide encounter a life-threatening complication. In a conflict or a crisis, pregnant women are even more vulnerable because health services have collapsed, are inadequate, or non-existent. But these women need access to quality emergency obstetric care whether they live in a conflict zone, in a refugee camp, or under plastic sheeting after a devastating earthquake. In fact, they need the same help that all pregnant women facing a complication need: access to appropriate medical assistance—skilled medical staff, drugs, and equipment—to save their life and the life of their baby. Doctors Without Borders/Médecins Sans Frontières (MSF) makes it a priority to provide lifesaving, emergency obstetric care in both acute and chronic humanitarian crises. In the organization’s emergency activities, teams strive to address the five main causes of maternal death: hemorrhage, sepsis, unsafe abortion, hypertensive disorders, and obstructed labour. The provision of emergency obstetric care is at the forefront of MSF’s work in sexual and reproductive health. Additional medical care provided to women by MSF includes antenatal and postnatal care, family planning, assistance to sexual violence survivors, fistula treatment, post-abortion care, and prevention of mother-to-child transmission of HIV. Conflict, epidemics, natural disasters, or the complete breakdown of a country’s health system are crises faced by MSF’s millions of patients around the world every day. But a maternal death: that’s the avoidable crisis.